Dr. Mamta Arora graduated (MBBS) from Sir JJ Medical College, Mumbai with distinction. Thereafter she pursued Masters in General Surgery (MS) from TNMC and B.Y.L Nair Hospital, Mumbai, India in 1999. She has had a brilliant post-graduate career, and has been working in the Middle East for the last fifteen years. She is also a member of the prestigious Royal College of Surgeons of England (MRCS-England). Prior to joining NMC, Dr. Mamta has worked in the Ministry of Health, Oman where she was the Trauma Coordinator and in charge of the Accident and Emergency section in a regional referral hospital. She has secured Fellowship in Minimal Invasive Surgery (FMAS) from the prestigious World Laparoscopy Hospital, India. Dr. Mamta is a Fellow of Indian Association of Gastroenterological Surgeons (FIAGES). She is also a member of Asia Pacific Hernia Society (APHS). Dr. Mamta has taken special training in Varicose Vein treatment from UK and has been offering Radio-Frequency Ablation (RFA) in NMC Healthcare since 2013 with commendable outcomes. She has also trained in laparoscopic endocrine surgery from Taiwan from the prestigious IRCAD-Taiwan (specializing in MIVATS – Minimally Invasive Video Assisted Thyroid Surgery, for the thyroid & parathyroids). She has been actively involved in breast cancer screening and educational programmes at NMC Healthcare. She has also attained a Masters in Healthcare Administration (MHA) from Walden University, North Carolina, USA. Dr. Mamta is also ATLS certified (from the American College of Surgeons) and has a vast experience in the management of trauma. Dr. Mamta practices all general and laparoscopic surgeries. Her special areas of interest are RFA – varicose vein treatment, thyroid and breast surgeries, gall bladder and hernia surgeries. Being a female doctor, she can ably manage and is very sensitive to the detection and management of breast diseases including breast cancer. 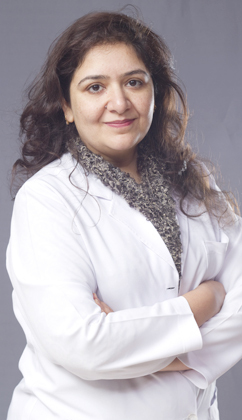 Dr. Mamta is proficient in English, Arabic, Hindi, Marathi, Urdu and Punjabi.